Clemence dreams of abandoning her monotonous middle school existence to wander around the world stealing excitement, like her parents, who are robbers. Until one day when a nauseatingly serene happiness settles over her school with the arrival of Simon. Everyone wants to talk to him, to get to know him, to like him. Simon is not like the other boys. His face and his body are covered with new patches of bright and changing colors every day. One day Clemence makes the first step toward Simon, out of curiosity. She would just like to know where he got his colors from. But he thinks this is none of her business. Clemence decides to find out the truth about his secret. 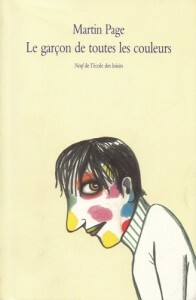 Publishing house : L »école des loisirs, 2009. Translation rights : Korea (Yolimwon), Greece (Ellinika Grammata).